There’s nothing like a morning walk down the beautiful beach as the sun rises over the Atlantic Ocean and watching a pod of dolphins playing and jumping only a few yards from the shore. Watching the dolphins surf as you get ready to start your day in North Myrtle Beach, South Carolina is always a memorable time and offers many photographic opportunities and breathtaking moments you will not want to miss. At the end of the day, when you get back from your North Myrtle Beach area adventures, take the elevator up to your private North Myrtle Beach vacation rental. Enjoy the specious floor plans of these exceptional North Myrtle Beach condos that this North Myrtle Beach resort has to offer. Enjoy the view of the sun rising over the Atlantic Ocean or the starlit sky from an array of windows that provide a must-see, spectacular view. Each North Myrtle Beach condo at Emerald Cove I comes with a view of the Atlantic Ocean that makes you feel as if the beach is close enough to touch. When you enjoy your morning coffee sitting comfortably in a chair on the balcony that overlooks the Atlantic Ocean and when you open a bedroom window while you take a well deserved nap, the beautiful Atlantic Ocean will provide an amazing backdrop to an unforgettable stay in North Myrtle Beach, South Carolina. Make yourself at home by resting on one of the comfortable beds in these North Myrtle Beach condo rentals or watch your favorite programs on any one of the conveniently furnished televisions in these condos in North Myrtle Beach, South Carolina. Bring your child’s favorite movie to play in one of the DVD players that are available in your private North Myrtle Beach vacation rental. Feel free to cook a family dinner or a make a snack using the full kitchen and a range of appliances and cookware that are provided for you in each North Myrtle Beach condominium at Emerald Cove I. The kitchen is designed for your comfort. There is plenty of room to include the whole family when cooking a delicious meal or cutting up some fruit to share. Opt to use the grill area at this North Myrtle Beach resort for your cooking pleasure. Not up for cooking? You can always order in from many of the delivery restaurants the Myrtle Beach area has to offer and enjoy your dinner while listening to the ocean waves in the your wonderful home away from home at Emerald Cove I. Every day you can watch the impressive pelicans fly over the Atlantic Ocean as you slip into the hot tub, ocean side. From your North Myrtle Beach condo balcony you can look down and see the swimming pool, hot tub and all waterfront actives. You may also even get close-up views of one of the spectacular pelicans flying in the bright blue sky. After a full day of family fun, relaxing poolside and finding adventures and entertainment in North Myrtle Beach, South Carolina you will be thankful for the Jacuzzi tub that waits for you in one of the bathrooms in your North Myrtle Beach condo at Emerald Cove I. For even more comfortable convenience, a washing machine and clothes dryer are available in your North Myrtle Beach vacation rental for your family’s convenience. 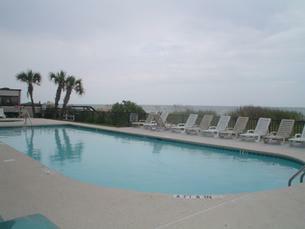 Some of the Emerald Cove I condo rentals have high-speed Internet access that could be available to you. Shopping, dining, live entertainment theatres, Myrtle Beach golf courses, water sports and so much more are just around the corner from Emerald Cove I. You can shop the outlet malls and eat seafood on the waterfront during your North Myrtle Beach vacation. There are so many live entertainment theatres around Myrtle Beach, South Carolina that you can easily find a show that interests everyone in your family while also finding a convenient show time. There are nearly 100 Myrtle Beach area golf courses so make a tee time or two and give your golf clubs a workout during your North Myrtle Beach vacation. Water sports in the area include banana boat rides, Sea Doo rentals and parasailing. Additional amusements around town include miniature golf courses, ice cream shops, Myrtle Beach SkyWheel, laser tag and more! Your vacation at North Myrtle Beach, South Carolina will be one you will want to repeat year after year. While on your North Myrtle Beach vacation the food and family fun is limitless and located remarkably close to your North Myrtle Beach resort. Emerald Cove I is a North Myrtle Beach resort that will become your home away from home where you and your family and friends feel most relaxed and at ease. North Myrtle Beach, South Carolina and Emerald Cove I will be everything you expected and needed.